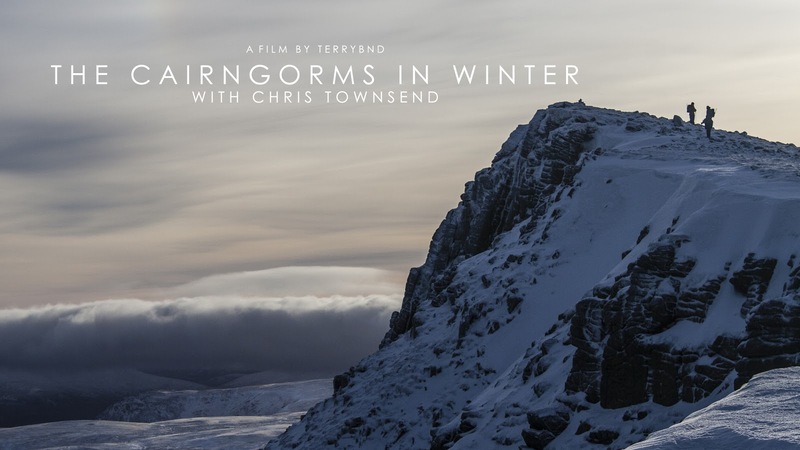 Today I am very pleased to announce the launch of a Kickstarter project with outdoor film maker Terry Abraham. This exciting project will see us venturing into the Cairngorms in winter, one of the most beautiful and potentially one of the most severe mountain environments in the British hills, to show the spectacular winter landscape and look at how to enjoy it safely. 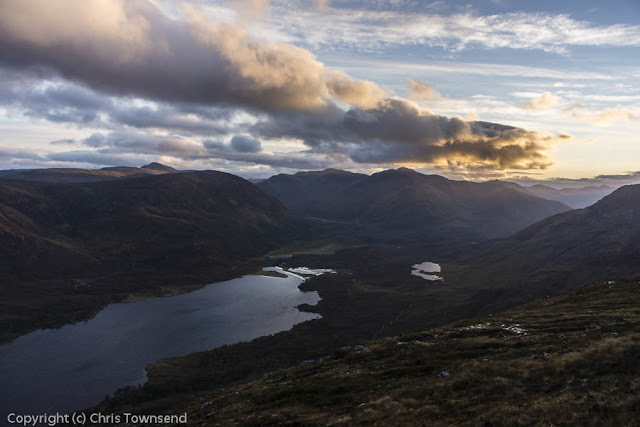 We'll be camping and hiking in all conditions to bring you a real feel for the power of winter in this tremendous place. 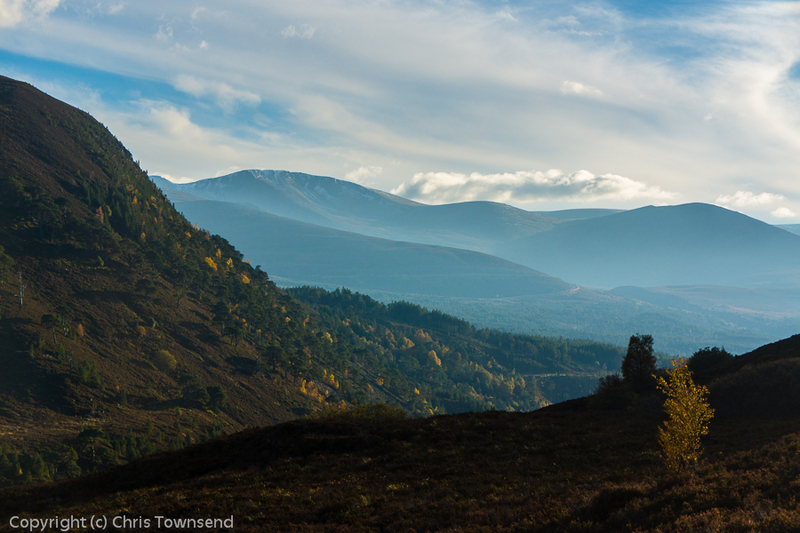 As I write this I am looking out on the distant hazy snow-spattered high tops of the Cairngorms. I can't wait to get started! Terry has written about how this project came about on his blog here. Please visit the Kickstarter page to see the details and what's on offer for various pledges. 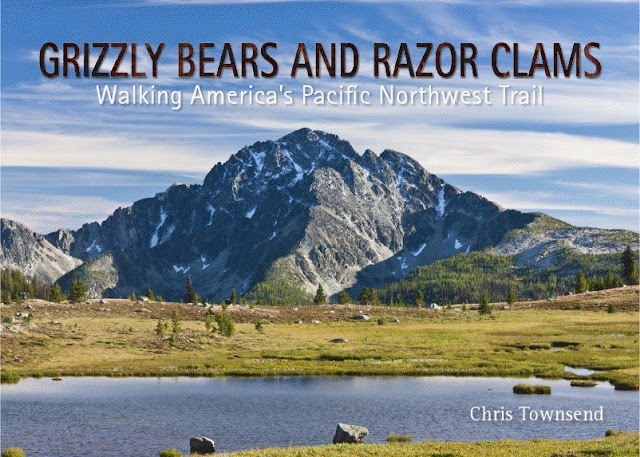 Grizzly Bears and Razor Clams, the story of my hike on the Pacific Northwest Trail continues to receive good reviews. There have now been ten of these, which I hope will encourage those of you who haven't yet read the book to give it a try. Here are the latest two reviews plus a round-up of earlier ones. America's Library Journal says "Townsend makes every word count. 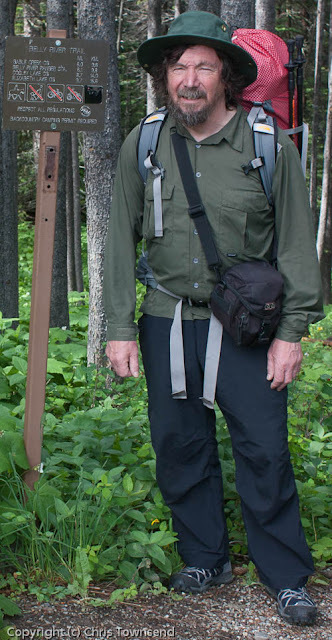 Readers interested in the Pacific Northwest and wilderness backpacking will enjoy the combination of nature writing and practical advice." 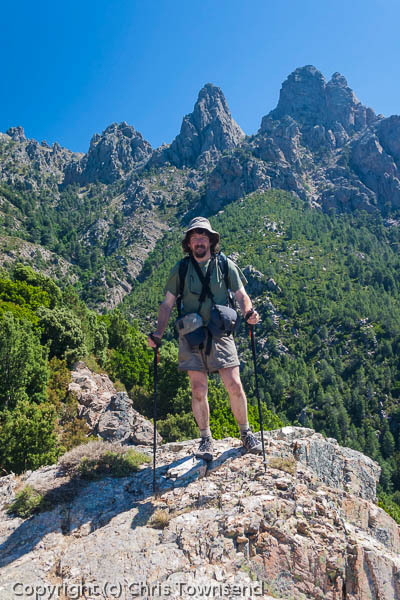 Geoff Gafford has reviewed the book on his Litehiker blog and in the autumn issue of Backpack, the Journal of the Backpacker's Club. Geoff says "he writes well and manages to make this far more than the "I got up early ..." type of account and my interest was sustained throughout .......... I enjoyed this book. It is well written and an engrossing read. It made me want to be on the next flight across the Atlantic!". 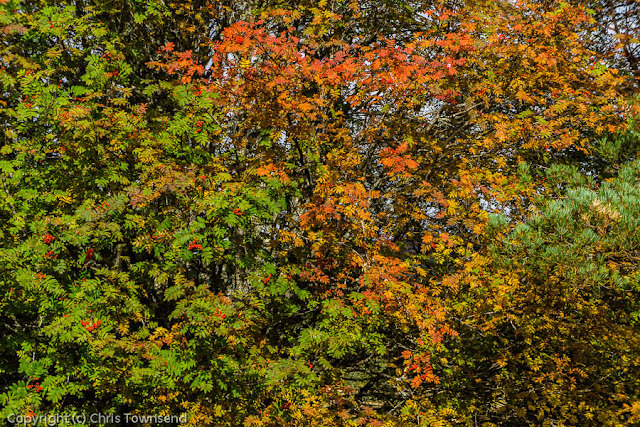 Previously in The Seattle Times a short review mentioned 'the gorgeous color photographs included on nearly every page' while on Amazon.com Frank R. Ward, who reviews many hiking and outdoor books, posted an interesting review entitled A Good Scottish Effort at an American Art Form in which he writes 'if you take some time with this book, you too can vicariously enjoy Townsend's experience. His was a hike worth sharing'. 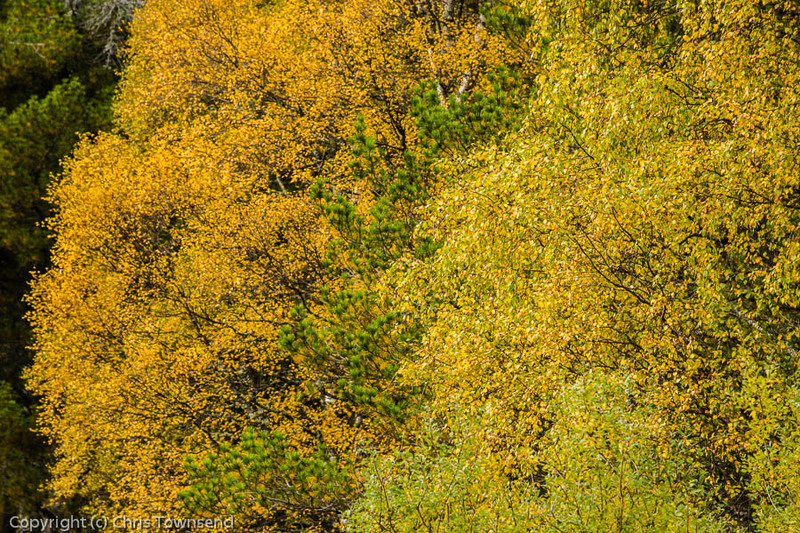 Over on Hiking in Finland Hendrik Morkel says "such a good read that I had a hard time to put Grizzly Bears and Razor Clams down" and "an easy read, well written and has fantastic photos". On the My Outdoors website the reviewer writes "Grizzly Bears and Razor Clams reveals his real and total love of the wilderness .... if you like a good story there's plenty to keep your attention and if you like something with a message you'll find more than a touch of John Muir in the author's love for and feelings about the wilderness world". 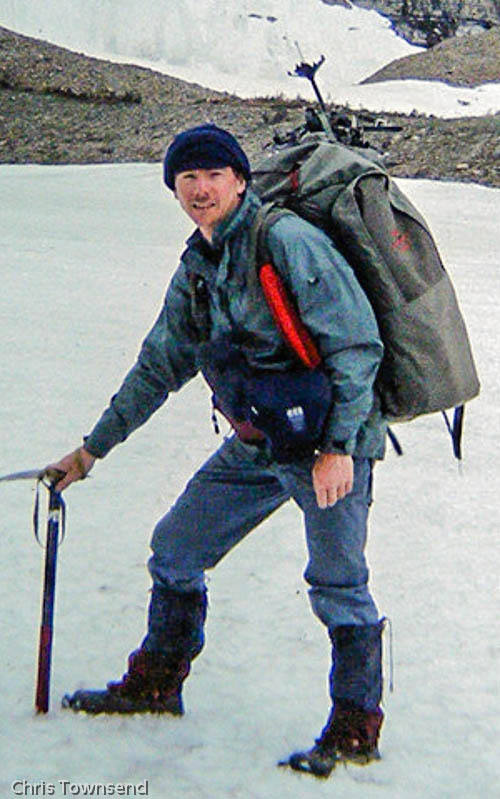 Popular outdoor blogger Andy Howell on his must be this way blog says "Chris captures beautifully the relationship that a walker develops with the land that he or she is hiking through ...........Chris’ insights into the plight of the natural environment can be quite profound but never are they preaching.......an easy and entertaining read about a wonderful trip". On another popular outdoor blog, Blogpacking Light, Robin writes "good travel writers have a knack of transporting you into their journey, making you feel like you are participating in their adventure. 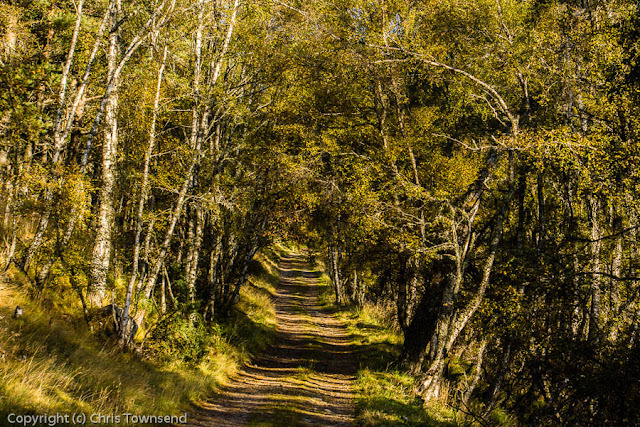 Chris does this well with pithy descriptions of landscape, flora, fauna and his own feelings and emotions." 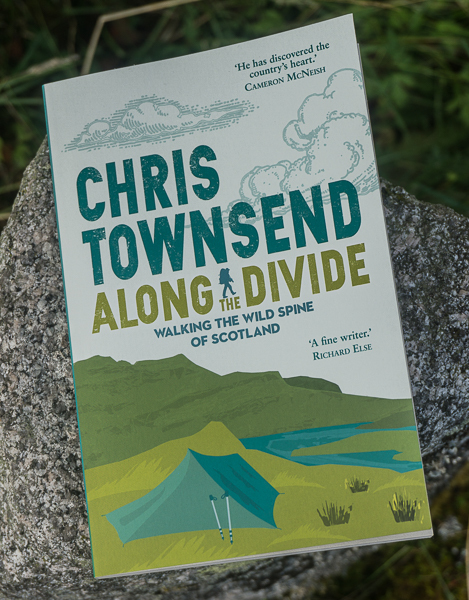 Finally, Tony Hobbs writes on Amazon " we were allowed into Chris's mind in this book and it was a quite wonderful experience .... It is hard to fault the book, so I won't even bother trying. It was wonderful. Simply the best!" 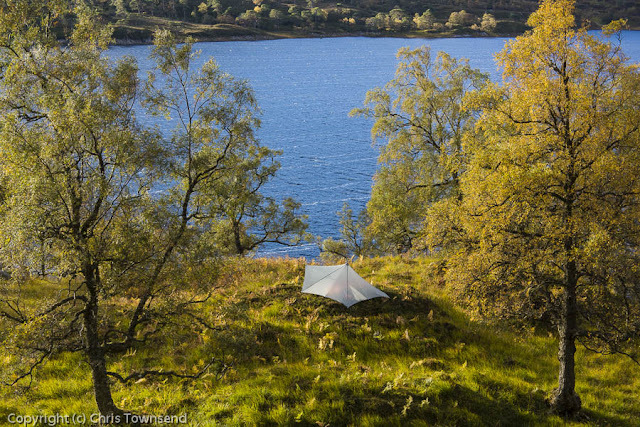 Ultralight, Lightweight, Traditional ... Or Maybe Just Backpacking? 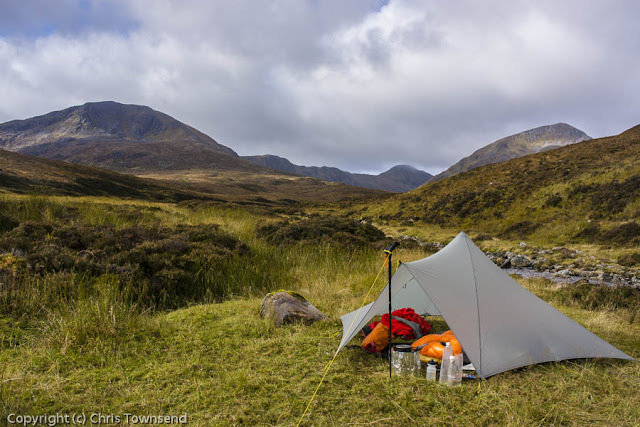 Over the last few weeks there’s been a debate on backpacking blogs about the trend in recent years for putting backpackers into categories – ultralight, lightweight, traditional and so on. 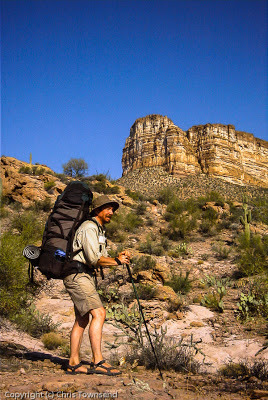 Now over the years I’ve mostly ignored this as not really anything to do with backpacking itself, though I have been mildly concerned at times by both the holier-than-thou and competitive aspects that sometimes appear in the ultralight approach. 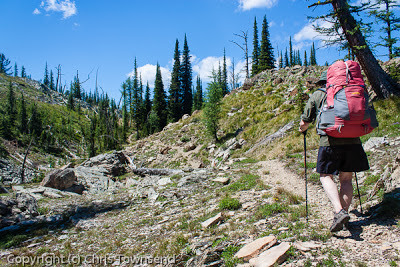 Backpacking should be about the experience not the tools and there’s nothing “superior” about any weight of load (I have an old book that says that loads under 60lbs don’t really count – real backpackers carry heavy!). The current discussion was started by Andrew Skurka on his blog. After reading this I wrote a piece for the September issue of TGO. As there’s obviously interest in this topic below is an edited version of this feature. 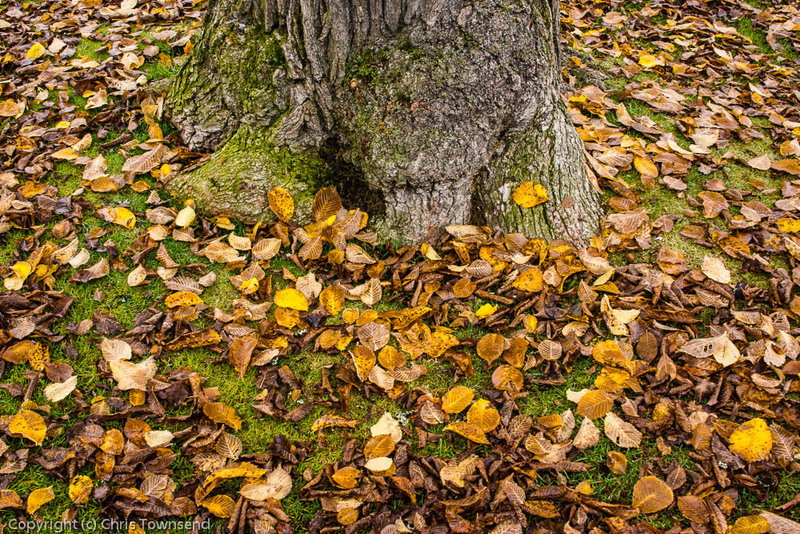 Since Skurka’s piece appeared as well as my article there have been blog pieces by Martin Rye, Dave Chenault, Jaakko Heikka plus another piece by Andrew Skurka. All have interesting points of view. 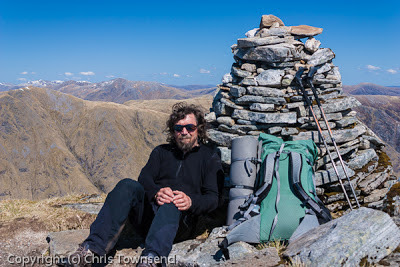 I like Martin Rye’s comment “we are all backpackers in the end”, as that exactly sums up my view. It’s why my book is just called The Backpacker’s Handbook. I don’t think the descriptions “ultralight” etc will die, though the emphasis on fixed cut-off weights and rigid definitions will hopefully fade away. A few years ago I wrote a piece for TGO about the history of lightweight backpacking, showing that it long predates Ray Jardine (and in fact goes back much further than described in my article). You can find this on my blog here. There will always be those who want to experiment with cutting weight to the minimum and there will always be those who carry very heavy loads. And most backpackers will continue to be in between the two. Anyway here’s my TGO article. 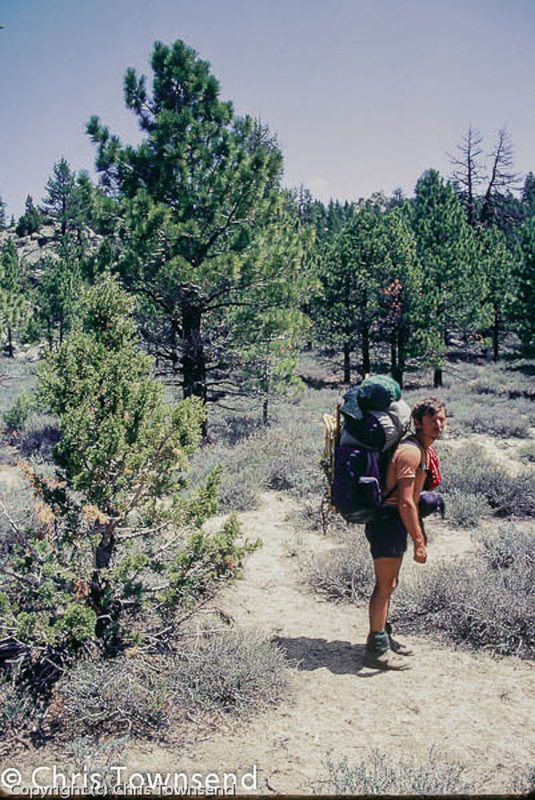 Backpacking only has one definition: hiking with camping gear so you can stay out overnight. Whether it’s a one night trip or a six month long distance hike, whether you camp on a campsite next to a pub or high in the hills, whether you walk all day or just a few hours, whether you sleep under a tarp or in a bivi bag or in a geodesic dome, whether your pack weighs 5 kilos or 25 kilos it’s all backpacking. There are no rules and style and gear are a personal choice. Labels are arbitrary and have no real significance. What it comes down to is choosing the right gear for the circumstances and being able to use it properly. This brings up the question of what is too heavy and what too light. In recent years “ultralight” has been a big trend, to the extent that it has sometimes seemed that all that mattered was getting below a certain weight rather than considering how well the gear would perform. This has led to some people suffering sore backs from inadequate packs, cold nights from too-thin sleeping bags and cold, wet days due to insufficient clothing. Long distance adventurer Andrew Skurka (his impressive Alaska journey involved skiing and rafting as well as hiking shows he’s more than a backpacker) discussed this recently on his blog under the eye-catching heading “Stupid Light” (http://andrewskurka.com/2012/stupid-light-not-always-right-or-better/). In the past he has been a big proponent of ultralight backpacking. Now he admits that this meant that at times he took gear that was too light for the conditions and omitted gear he should have carried, hence “stupid light”. Whilst still travelling light he now carries a little more and says he is more efficient for doing so. 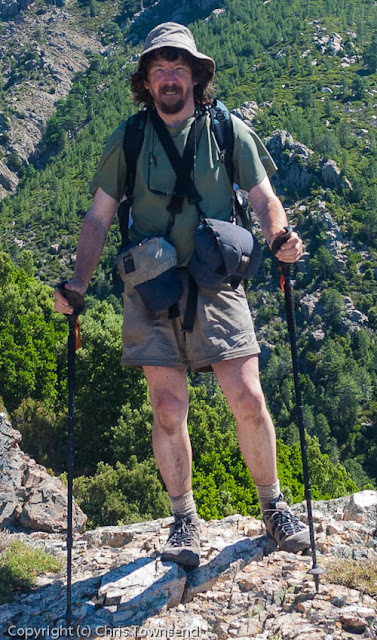 He’s discovered fleece clothing, trekking poles, inflatable mats, gaiters and more. It’s good to see such a well-respected and influential hiker saying this. I hope people listen. Weight isn’t the only criteria for backpacking gear. Of course there is a converse to “stupid light”, namely “stupid heavy”, and I have to admit to doing this in the past. I have only gone “stupid light” a few times and that was for short trips when testing gear. However I’ve carried unnecessarily heavy loads too often, sometimes for days on end on long walks. Partly I think this was because I’m a British backpacker and therefore had to deal with rain and wind. Staying warm and dry was more important than the weight of gear. 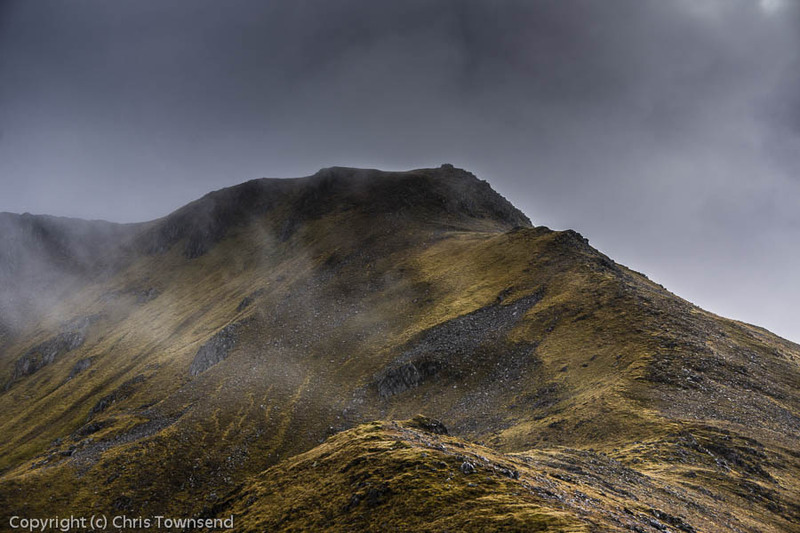 I don’t think it’s a coincidence that Andrew Skurka discovered that his ultralight approach didn’t work so well when he encountered wet and windy conditions. When they are the norm you have to carry more. However whilst I may have been carrying more weight than necessary, sometimes much more, this did not really affect my enjoyment of trips. 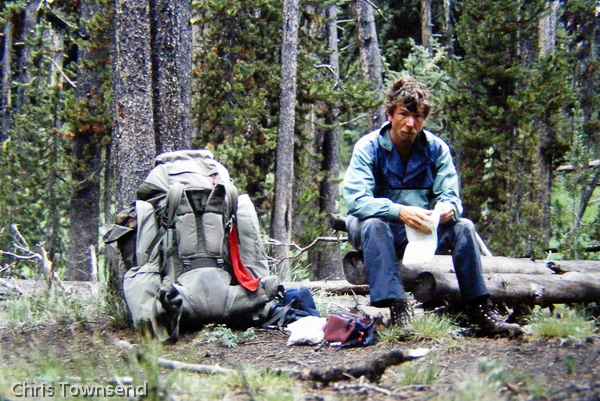 Most of my long walks from the late 1970s to the mid 1990s were done with packs weighing 40-60lbs. That sounds heavy now. It seemed the norm at the time. I might have done the trips more quickly with a lighter load but that’s the only difference it would have made. For many years now I have carried gear I think will comfortably cope with expected conditions. I want my load to be as light as possible but I also want to be comfortable and definitely don’t want to be cold, wet, aching or hungry. 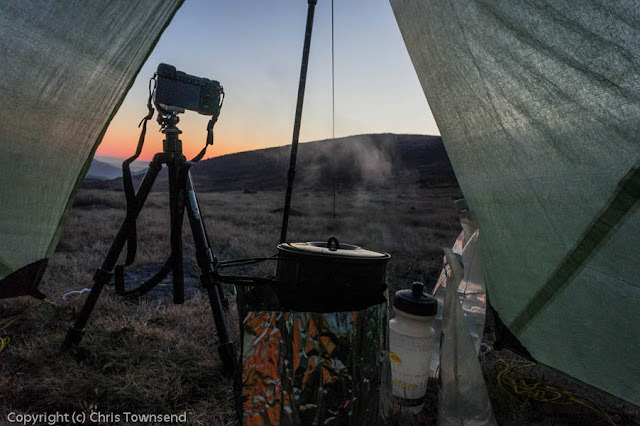 The right selection of gear, chosen on the basis of function and weight and not just the latter, that is suitable for the expected weather is the way to go. 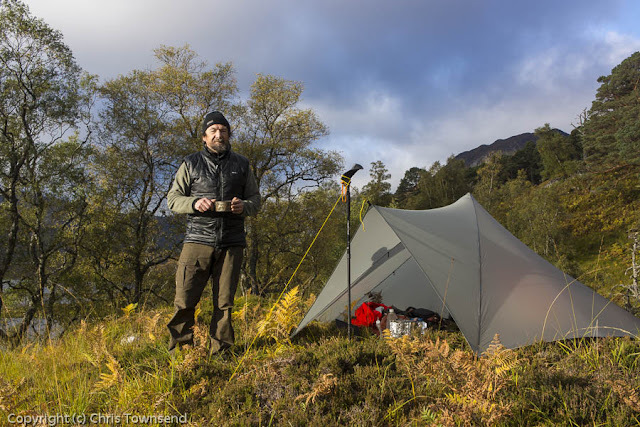 Choice comes into this – boots or shoes, tent or tarp, down or synthetic, foam pad or inflatable mat – but what matters is that the gear performs as you require and that you are comfortable with the weight you’re carrying. There is nothing “right” or “better” about meeting an arbitrary weight target. It’s purely to do with comfort. 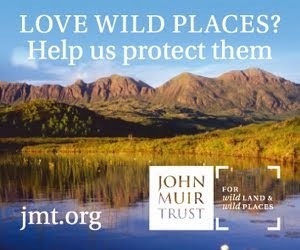 A strange day, beginning with the Allt Duine Wind Farm Public Inquiry, three TV interviews and much discussion and ending with nature screaming out how spectacular it can be. 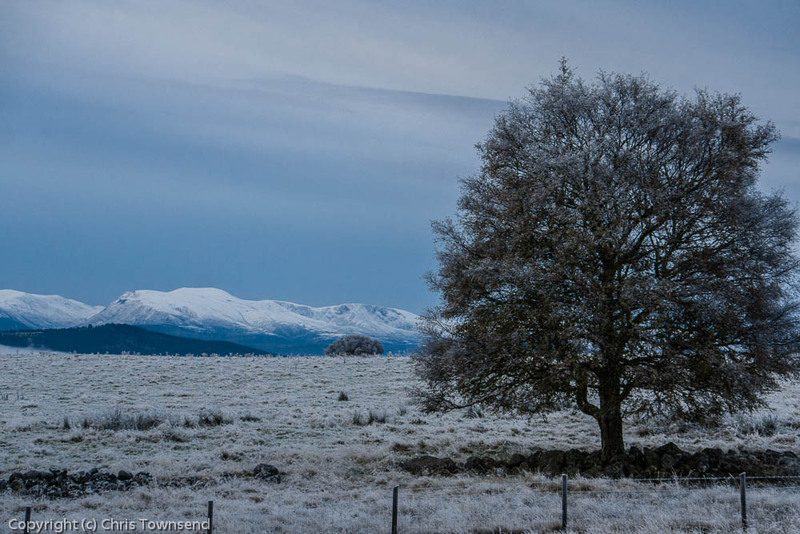 It began misty and frosty with ice to be scraped off the car and care needed as I drove in and out of thick banks of fog to Aviemore and the Inquiry. Sitting in the big conference room all that was visible out of the windows was the mist, blocking all views, cutting off the world. Inside the inquiry began and slowly progressed. As with other public inquiries I’ve attended it had a Dickensian feel rather than a 21st century one. Big ring binders were stacked up behind the participants. Every reference, and there were many, required changing binders and finding the right page and paragraph. Quietly assistants darted about bringing binders and sometimes maps or photographs to the tables. The only signs of modern technology were the microphones for speakers and the electric lights plus one or two laptops amongst the press and public. Most people, including myself, were making notes with pen and paper. 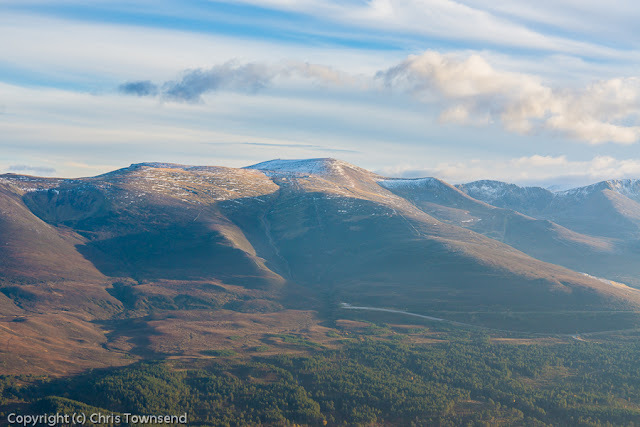 So this crucial inquiry, which will determine the fate of the Allt Duine area of the Monadh Liath, right on the border with the Cairngorms National Park (see this post), has begun. It’s scheduled to last two weeks then we have to wait for the reporters decision. On this first day the lines were clearly drawn regarding the landscape. 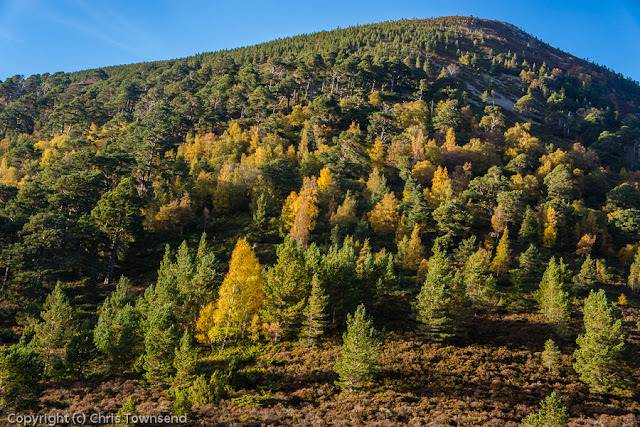 The developers, the local community council and the estate that owns the land say the Allt Duine area is not of significant importance and the wind farm will have little effect on the national park. 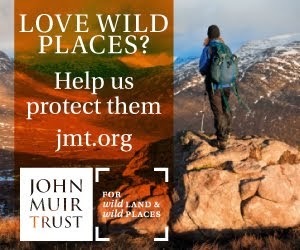 We – Cairngorms National Park, Highland Council, the Mountaineering Council of Scotland, the John Muir Trust, two adjacent estates and the Save the Monadhliath Mountains Campaign – say the opposite. I’m to give evidence and will be appearing to state my case and be cross –examined later in the week. A break for lunch came late and I spent it doing three interviews in quick succession for the BBC and STV. Filming again, though very different from that in the Corrieyairick with Cameron McNeish (see this post). Outside the mist was clearing and the sun shining. To sit in the inquiry and drift through the afternoon or head for the hills? The sunshine decided me, plus a strong feeling I needed to remind myself why this inquiry is, sadly, needed, so out of the door I went and into nature. 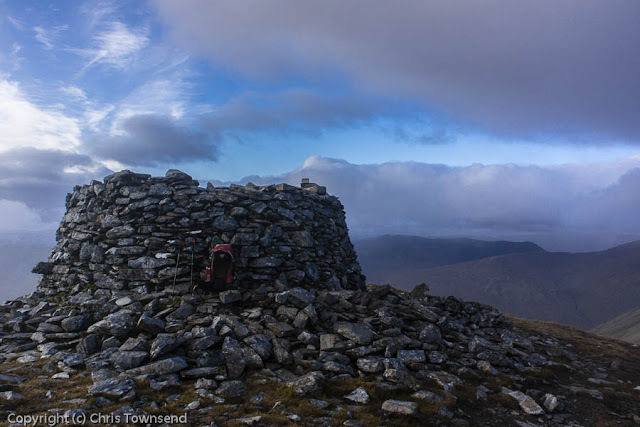 Ten days earlier I had intended climbing Meall a’Bhuachaille above Glenmore after my meeting with Berghaus. 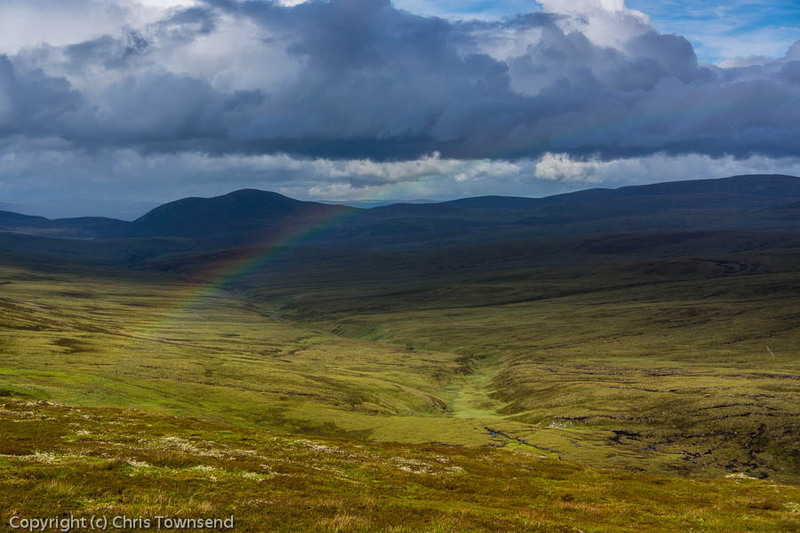 Low cloud and steady rain discouraged me then and I returned home instead. This occasion could not have been more different. I set off through a shining forest with the pines a rich green and every birch glowing gold. The light was sharp and clear. 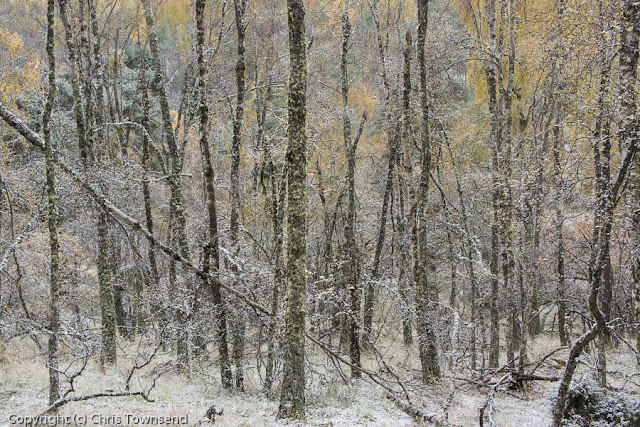 In shaded areas frost still lay on the grasses but in the sun it was hot and I walked with shirt sleeves rolled up. Once through the trees I began the ascent of this favourite hill, one I’ve climbed several times every year for well over two decades. Familiar yes, but never dull or boring and especially not today. 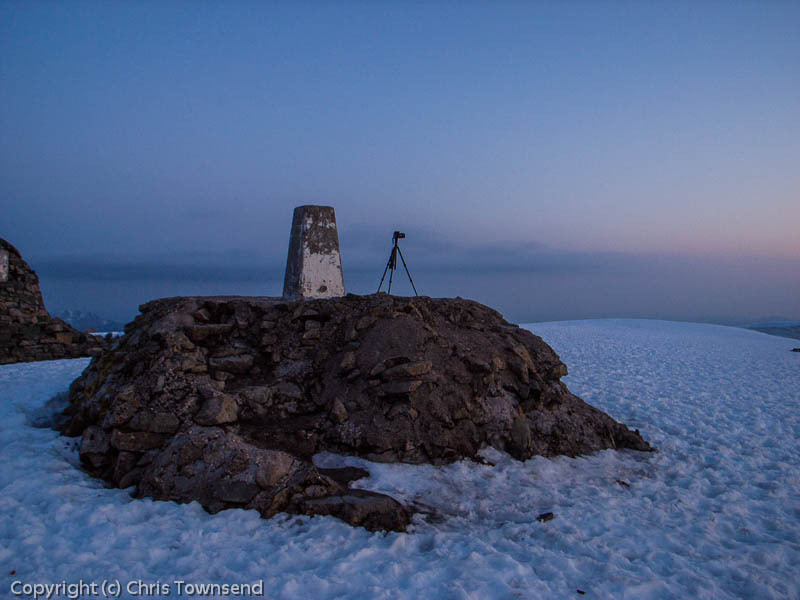 As I climbed the high Cairngorms appeared, spattered with the remnants of last weeks snow fall. To the west clouds were gathering. The summit was calm and the views extensive. Descending towards the bright ragged lozenge of Loch Morlich I watched the sinking sun start to bring colour to the thin streaks of cloud. The sunset should be good, I thought. How good, though, I had no idea. As the sun vanished and the soft peach of the clouds turned pink then orange I wandered down to Loch Morlich. 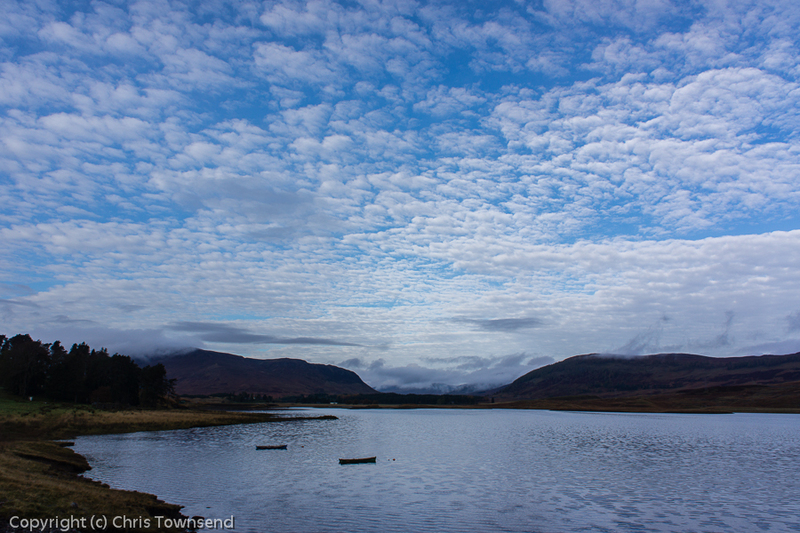 The water shone with the reflected clouds. I sat on the beach and watched as the sky darkened and grew richer and more colourful. 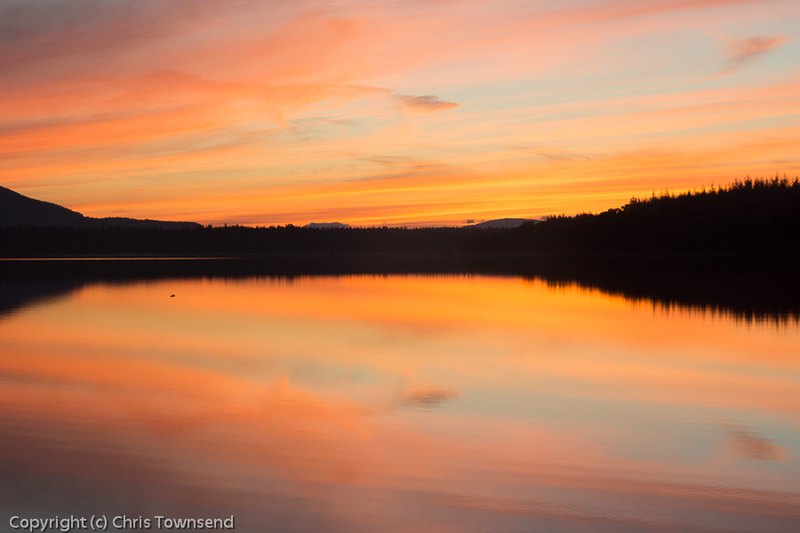 Air and water were on fire with a dazzling brightness. 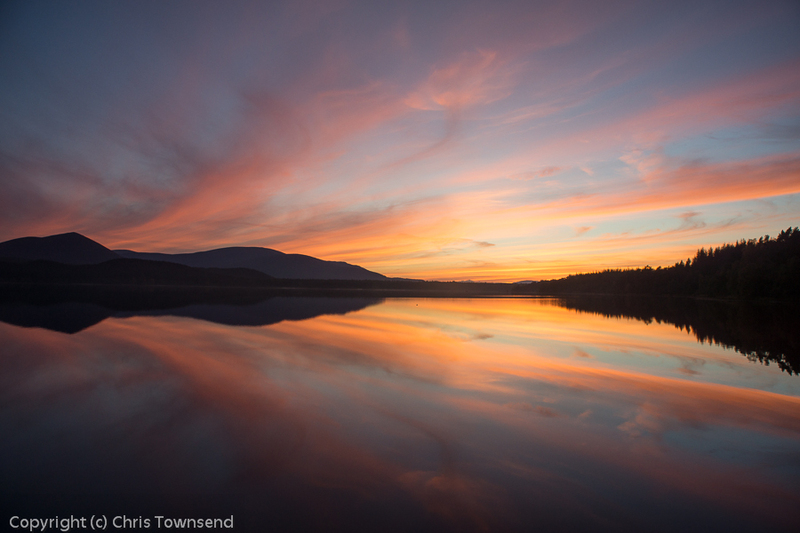 The landscape was putting on a spectacular show, as if to say this is what I can do, this is how glorious I am. A few months ago I went to a Symbolist Landcape exhibition as the National Gallery in Edinburgh. Many of the paintings were superb and I spent several hours there and came out dazed by the power of the art. But nothing there compared with this show. 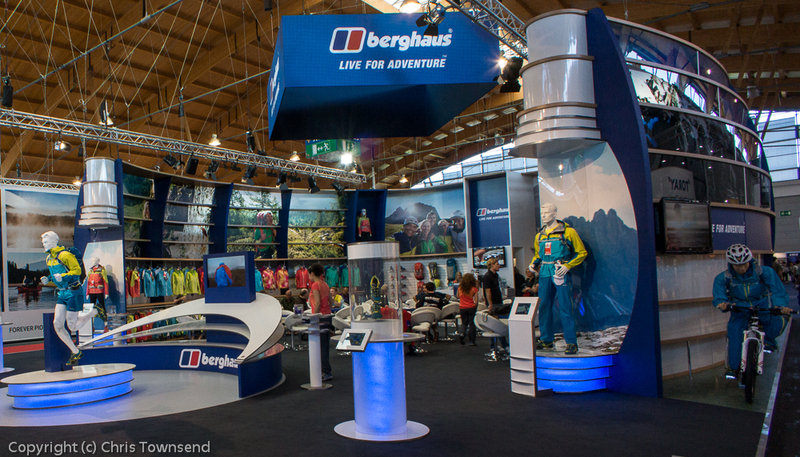 Recently a team from Berghaus came up to Glenmore Lodge to show me some of their new products. We had an interesting day looking at some innovative new gear - water-resistant down garments, ultralight trail running shoes, a lighter Bioflex pack system, auto venting waterproofs. 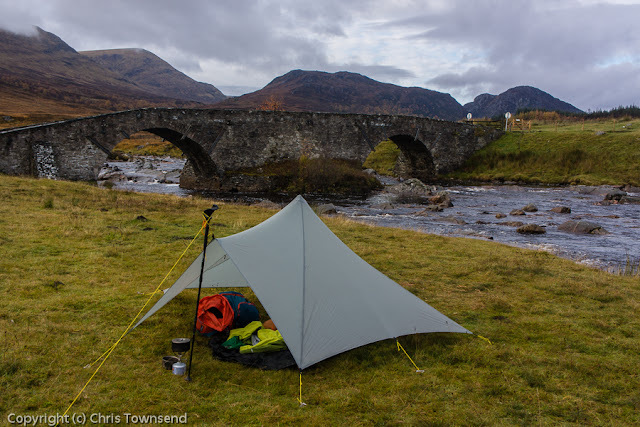 I've written about the products on the TGO website here. Films seem to be in my life at present. 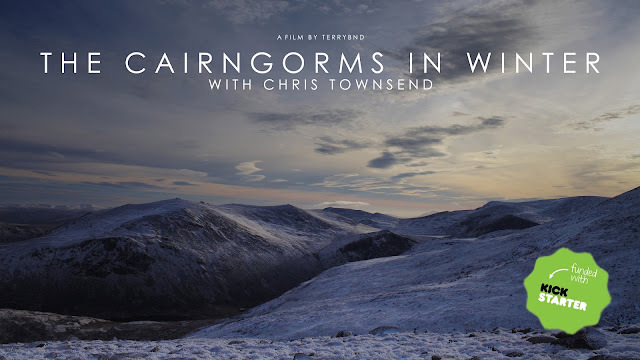 After posting a hint about a proposed film on the Cairngorms in winter with Terrybnd (see last post) I spent yesterday with Triple Echo Productions and Cameron McNeish filming for a BBC programme on Scotland End to End. 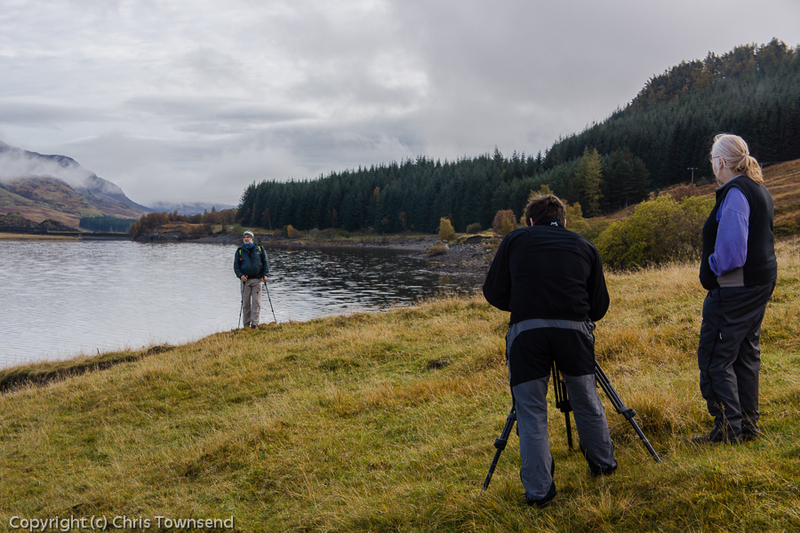 Together with producer Margaret Wicks and cameraman Dominic Scott, Cameron I went up to the Spey Dam loch and Garva Bridge and then walked most of the way up to the top of the Corrieyairick Pass (I reckon Cameron and I covered three times the distance as we repeated sections two or three times for different camera angles). The weather was reasonably kind with a fine dappled sky early on and then touches of sunshine and a slow build-up of cloud with the first rain drops falling just as we finished filming. 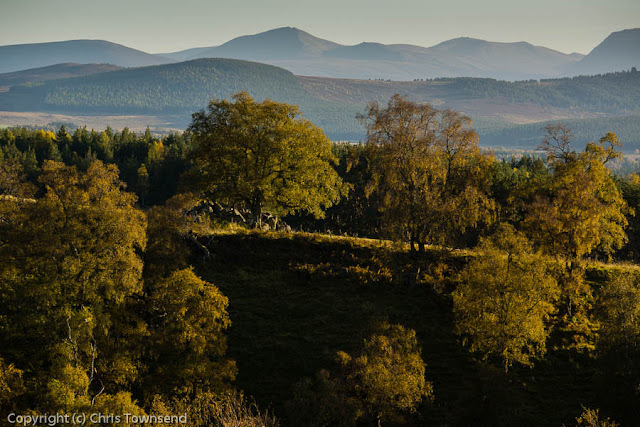 Stags were roaring in the corries, the hillsides were golden brown and wreaths of mist curled across the slopes, making it a real autumn day. 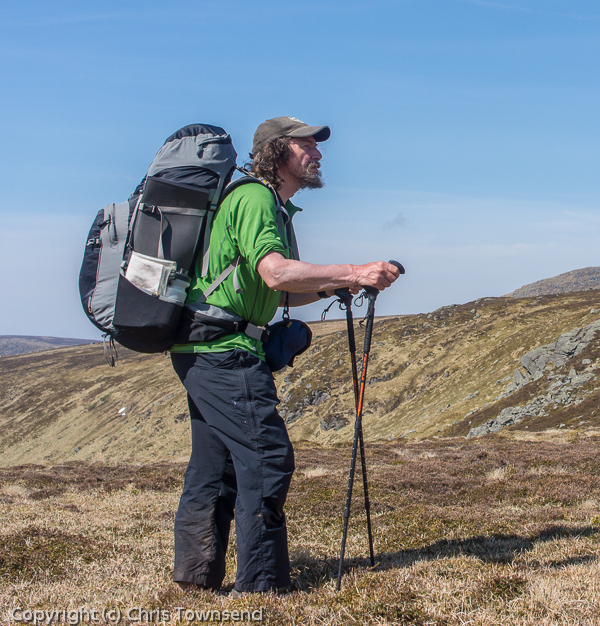 In between the walking Cameron chatted with me about long distance hiking, trails, Scotland, wild land and more. I set up a brief camp near Garva Bridge, finding it hard to concentrate being filmed pitching my shelter. How much of this will appear in the programme is another matter of course. The End to End route, which runs from Kirk Yetholm to Cape Wrath, looks a good one, passing, as it does, through some of Scotland's finest and, so far, still unspoilt landscapes. The book of the walk, by Cameron McNeish and Richard Else, Scotland End to End, is already out. 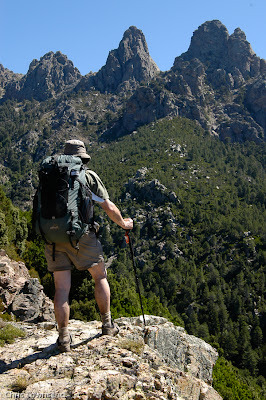 Rather than a simple guide book it's full of anecdotes and stories with just short route descriptions. 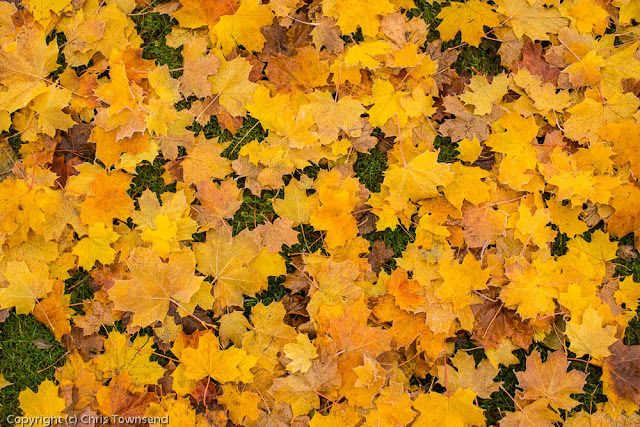 There's plenty of colour photographs to inspire you too. The film will be shown in two hour long episodes over the Xmas and New Year period. Mine will only be a small part of course. The whole route is 470 miles long. The Kingussie to Fort Augustus section, of which this filming was a part, is only 32 miles of that. Cameron has many other guests on the programme, one of them being photographer Colin Prior, who was filmed on An Teallach. You can read about that on the Mountain Media blog here. I must admit being envious of Colin, An Teallach being somewhat more attractive than the Corrieyairick Pass! Especially as the latter, already spoilt by a line of pylons, is being further disfigured by the construction of much bigger pylons. None of these are actually in place yet but the ugly wide bulldozed roads needed for the construction vehicles are already there. 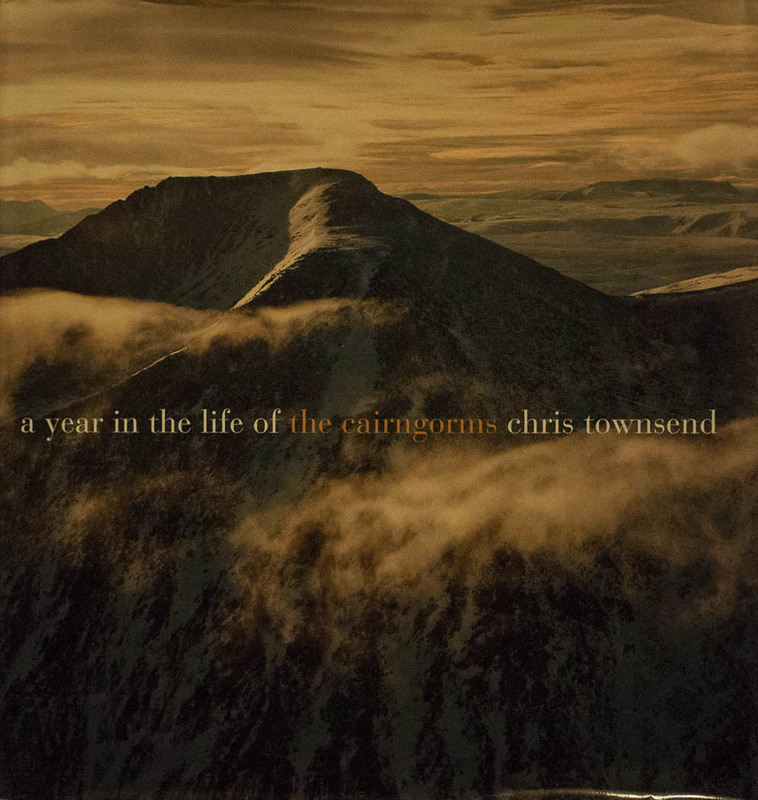 The Outdoor Writers and Photographers Guild has just announced the Awards for Excellence for 2012 and I'm delighted to find that my photo book on the Cairngorms has been Highly Commended in the Outdoor book category. The judges said "this is stunning photography of a stunning region. The photographer's obvious feeling for the area is extremely well expressed through his pictures". For those interested in my last post on cameras and photography the images in the book were taken over a number of years on Canon 300D, 350D and 450D cameras with Canon 18-55mm, Canon 55-250mm and Tamron 11-18mm lenses plus a Sigma DP1 camera. The photo of the cover was taken a few minutes ago with the Sony Nex 7 and Sigma 30mm lens, 3200 ISO, f2.8 @ 1/60. 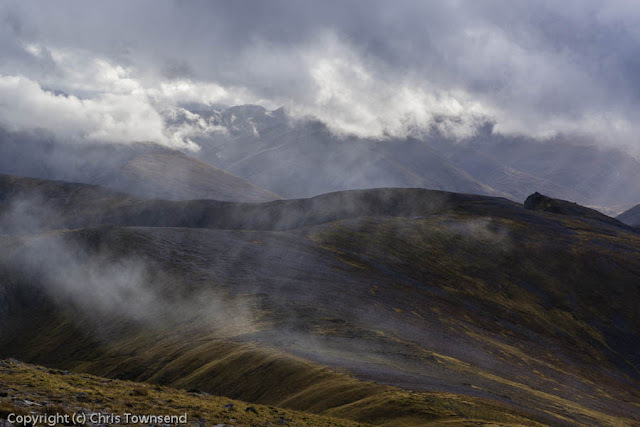 The rain began late in the afternoon as the world turned grey and the hills vanished into the solid clouds. Thirty-four hours later and it is still raining, the sky still dark and dense. 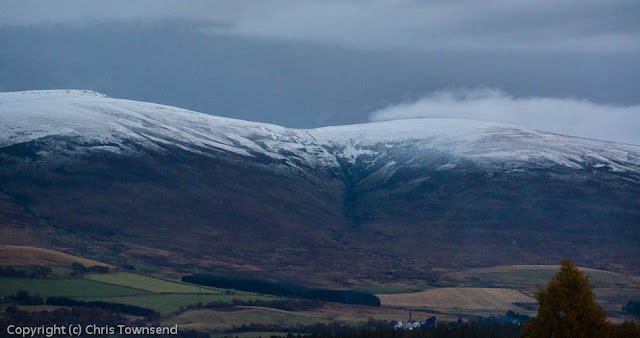 I drove to Glenmore Lodge to meet people from Berghaus and look, appropriately, at new hydrophobic down clothing, lightweight waterproofs, trail shoes and packs (of which more anon). Outside the mountains were hidden and the rain streaked the windows. Inside was a good place to be. I abandoned plans for an afternoon walk. Driving home every dip in the road was flooded. I was pleased to make it through some of the deeper pools. The River Spey was overflowing its banks, not for the first time this wet year. 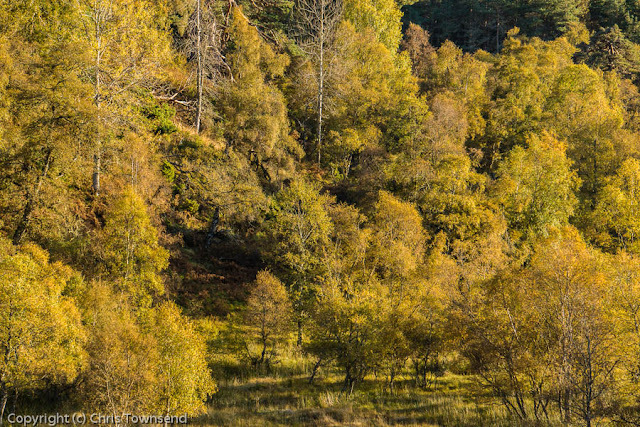 Before the rains came I wandered the local woods and fields to see how the Strathspey autumn colours were developing. 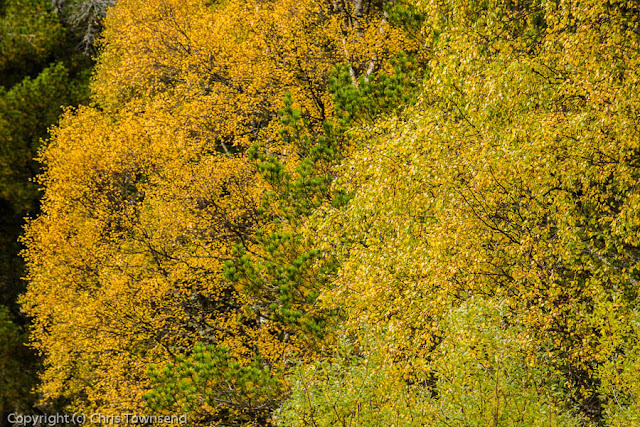 Some birches are gold, some still mostly green. 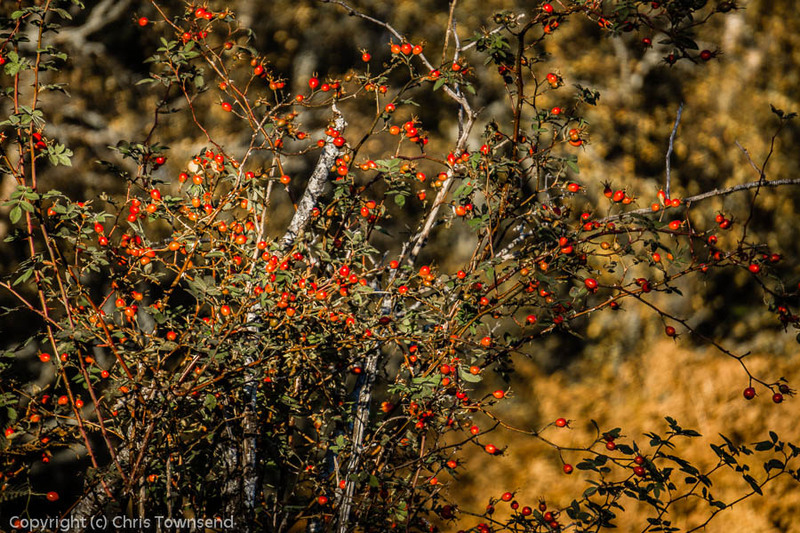 The rowans are rich with berries; their leaves a mix of red and dark green. 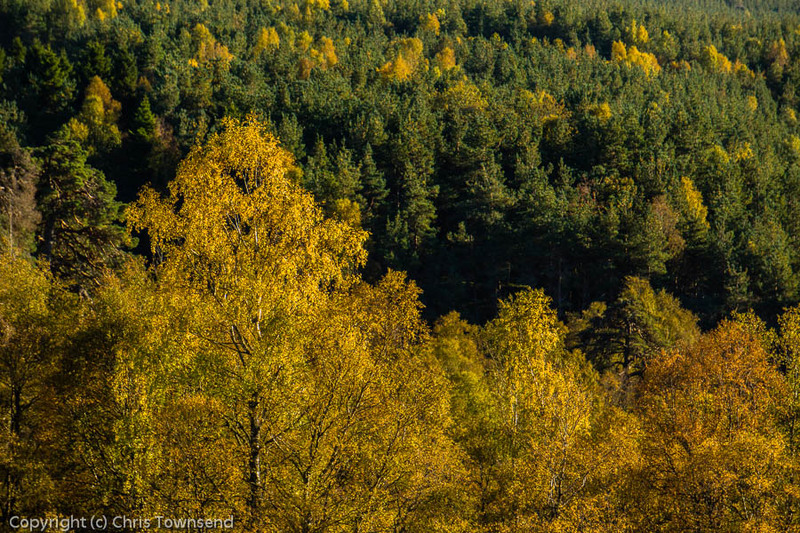 The larches and beeches have barely begun to turn. Many exposed trees have been stripped of their leaves by last week's gales. 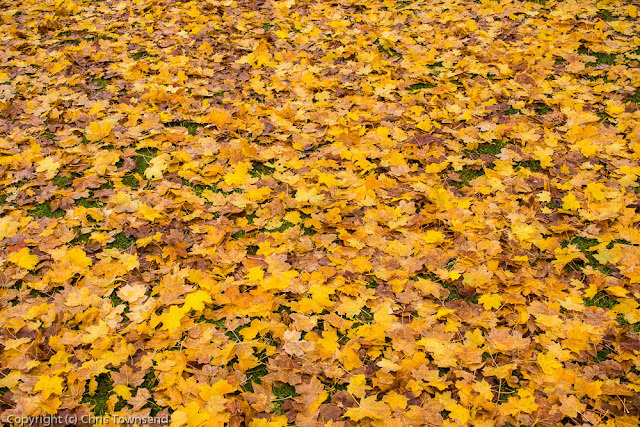 Underfoot the ground is soft and spongy. 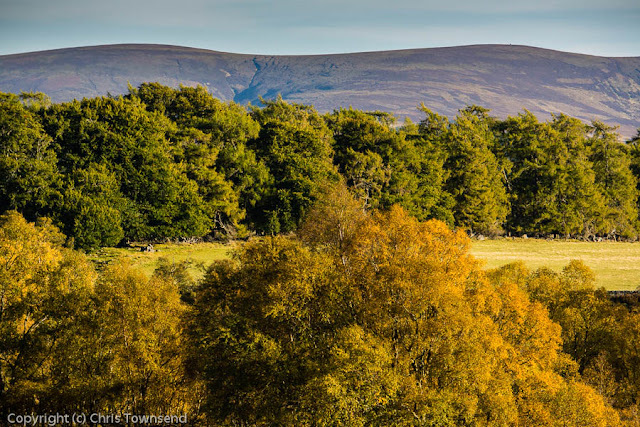 The distant hills are brown, the green tinge of summer, which always seems superficial, long gone. 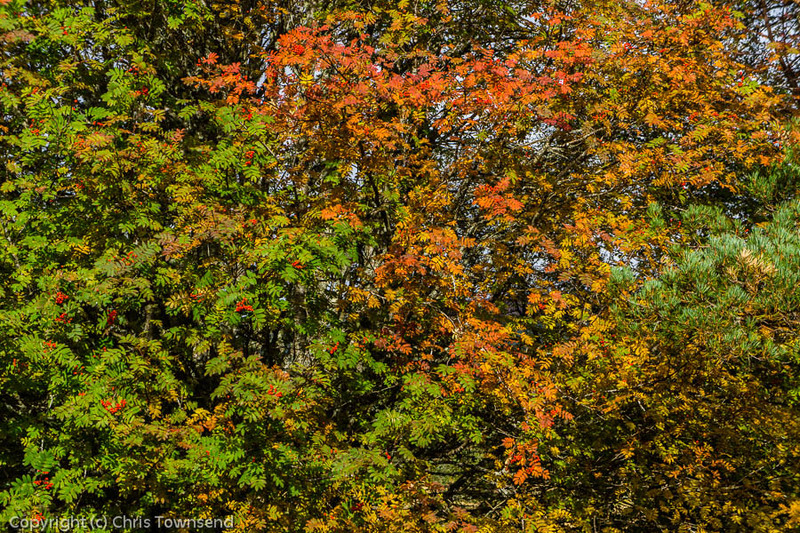 The colours are changing almost by the hour. 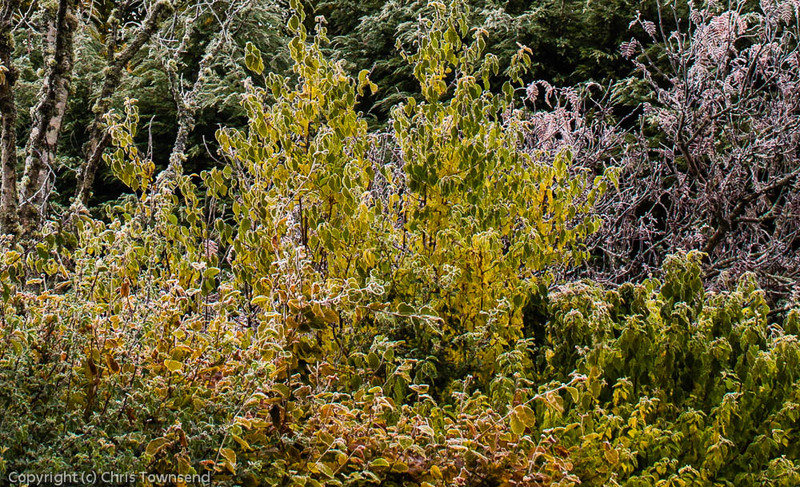 After a few more frosts they should be at their peak before the slow fade into winters starkness begins. By mid November the last leaves have usually fallen.